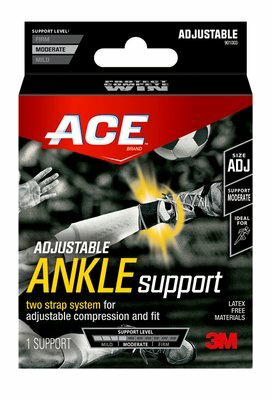 Stay in the game with the help of the ACE™ Adjustable Ankle Support. Designed with a convenient two-strap system, this ankle wrap lets you slip it on, adjust it to the perfect level of compression and get in on the action. It's compatible with most athletic footwear, and the stretchy, breathable materials are comfortable from the match to the post-game celebration. Reach for the ACE™ Adjustable Ankle Support and keep doing what you love. 1. Position heel in round cutout with ACE™ Brand logo above ankle. 2. Fasten bottom and top strap to desired compression level. Adjust straps as needed.